When we designed our new kitchen, fitting in a breakfast bar was a key consideration. 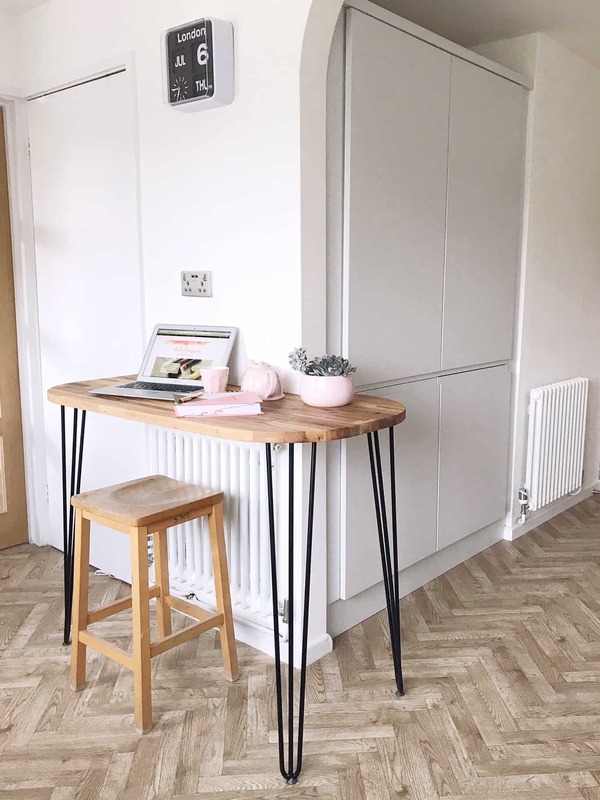 We chose hairpin legs, rather than cupboards, or regular silver coloured legs. This makes it more like a table, and lets light circulate around the room. I love the Mid Century look, and the hairpin legs are perfect for adding a touch of Mid Century style. I found The Hairpin Leg Co., online. 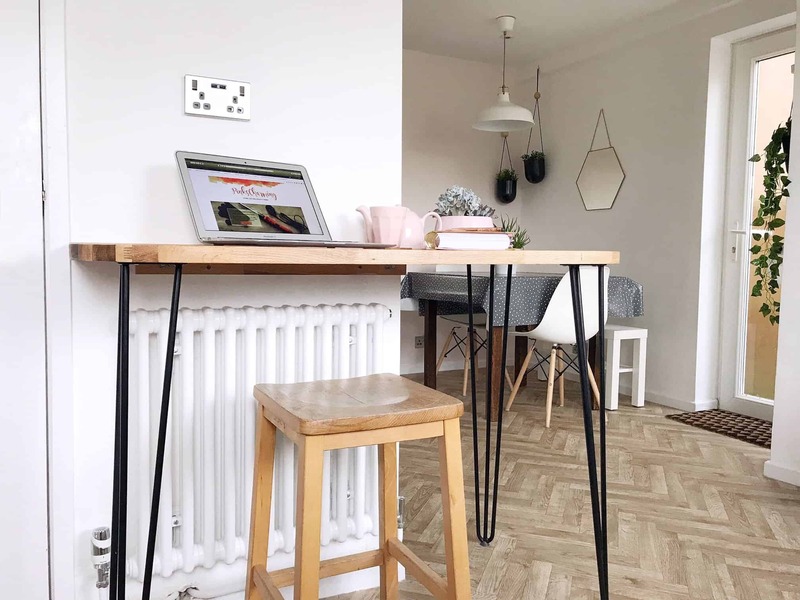 They have a great range of hairpin legs, from little feet all the way up to tall bar legs. They also have an Amazon shop, with great reviews, so I ordered a set of legs in black. We have black accents in the kitchen, plus Eames style dining chairs with black supports, so it ties it all together nicely. 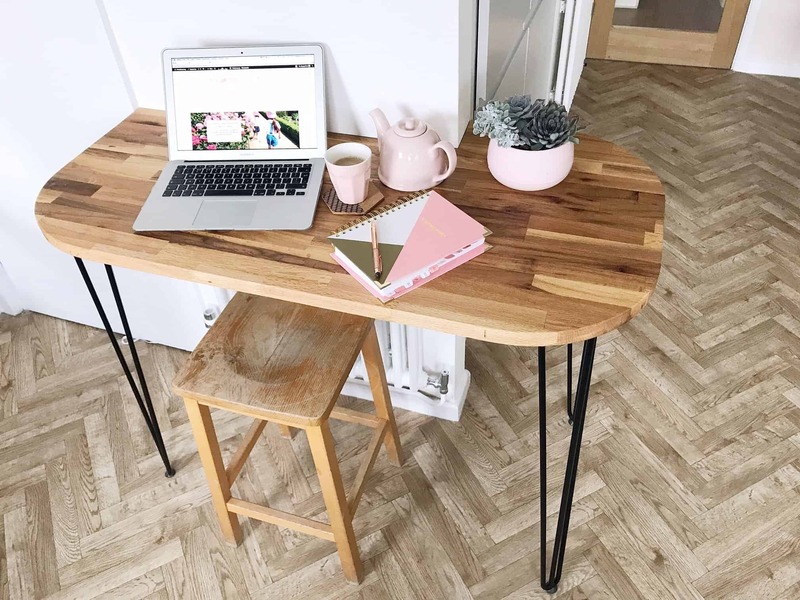 A length of worktop – Ours was the Hammarp Oak Worktop from IKEA. It was £120, but this was also enough to make a shelf, plus other off cuts of leftover wood. 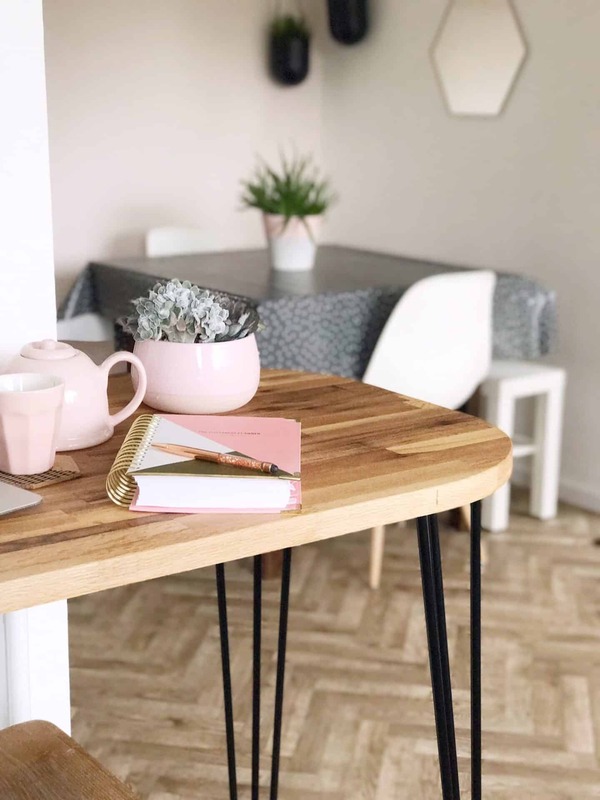 If you want curved corners, it is essential to have solid worktop: if you use one that is just coated with wood, the insides will show along the edges. 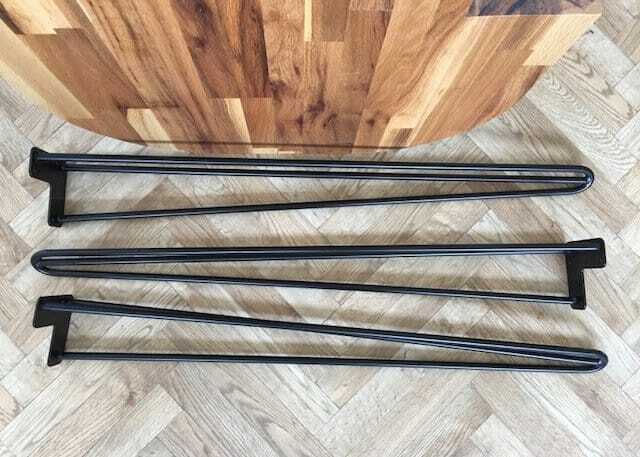 A set of Hairpin Legs – Our legs are from The Hairpin Leg Co. at Amazon* costing £49 for four for the 86cm version. They come with little protective feet and the screws. They are really heavy and high quality, which is what you want when they are supporting a slab of solid oak! I chose the three bar version, in black, but they do loads of other colours, and two bar versions too. An offcut of work to make a support, and two brackets. A pencil, tape measure and a screwdriver. To be honest, I panicked a bit when I saw the worktop against the floor, as it looks so orange! I treated it with Danish Oil, which you can get from Amazon* or DIY shops, and I didn’t think it had changed the colour too much. But against the paler grey tone of the floor, it doesn’t look great. Fortunately, once it’s actually put up, it looks a lot better! Cut your worktop to size, sand and oil/varnish. Make sure you have enough clearance to walk around it easily. We also rounded the corners to make sure there was plenty of space, and also to echo the rounded corder we have in our kitchen units. Screw a baton wood into the wall to support the section of the breakfast bar that’s attached to the wall. 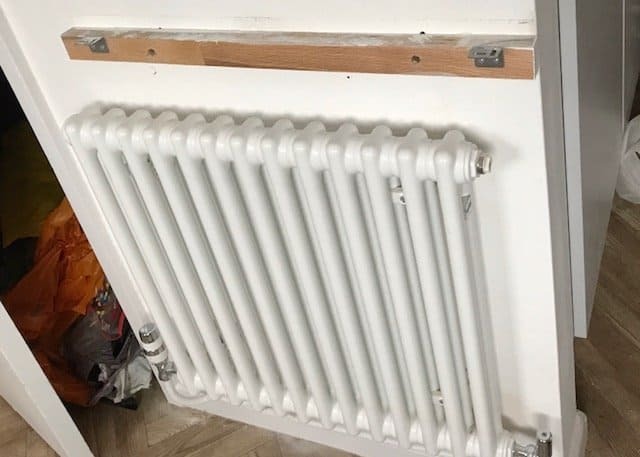 Our kitchen fitter cut it from the leftover wood and screwed it in to the wall using rawl plugs, and added small brackets to screw into the counter top. Measure carefully, so that it is the same height as the top of your legs. Don’t forget to take into account the little feet they will stand on too! Hold the worktop in place and slide the legs under, to make sure you’re happy with the placement. This is definitely a two person job. One of you will need to hold the heavy worktop whilst the other marks where the screws will go with a pencil. Out carpenter thought two legs, one at each end would be enough. It would have been sturdy enough, but I wanted one in each corner, apart from the one with the bracket. I’m so glad we did! 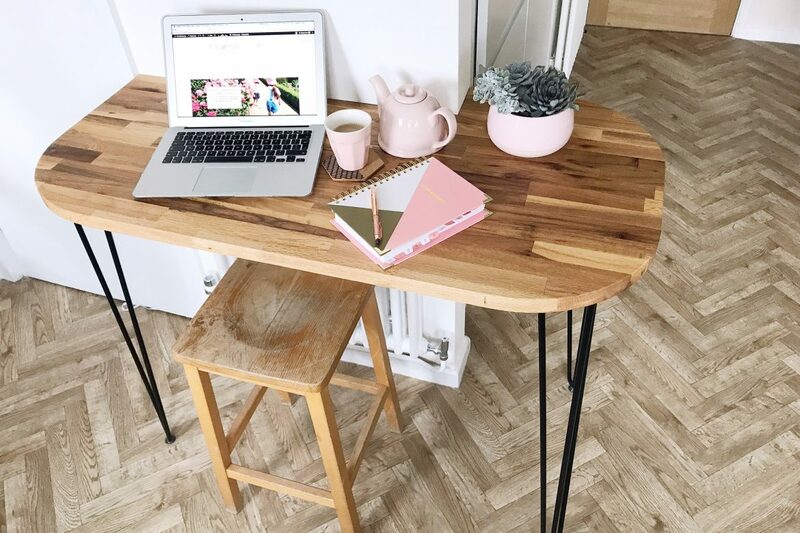 If you already have your stools, measure to make sure they will fit in between the legs, with enough clearance for elbows etc. 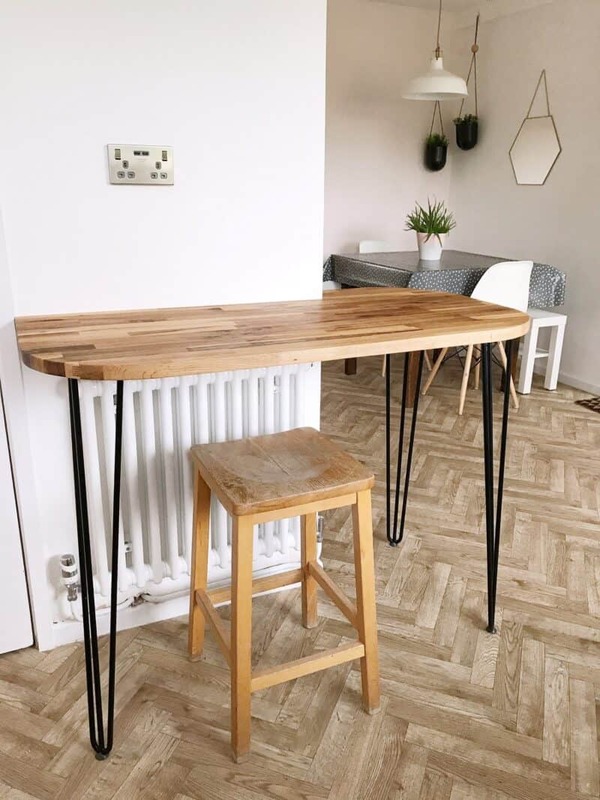 Turn your breakfast bar upside down and screw in the legs. The pencil marks you made will give you a rough guide, but make sure you measure the same distance from each edge so they are all even. 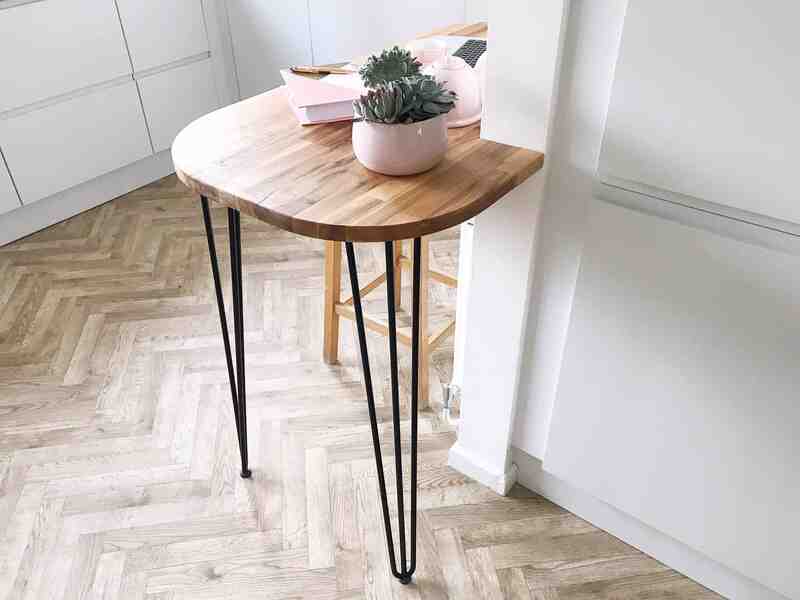 TIP: Make sure the base of the legs doesn’t stick out further than the edge of the breakfast bar – they are on a slight angle so you might keep tripping over them if you place them right in the corners of the worktop. Flip the breakfast bar over again, and screw into the wall. Voila! I’m so pleased with how our breakfast bar turned out, and I think it makes a unique addition to our kitchen. I’m using the breakfast bar to work at more than our home office. It gets so hot up there in the summer, and it’s so much cooler sitting in a bigger room. It also means I have easy access to the kettle for an unlimited supply of tea! Next, we will get another set of hairpin legs to make a matching bench for the dining table. We are using the old white IKEA TV bench temporarily, and Ava and Thea love sitting side by side at meal times. We have another offcut of wood already so it will be a quick and easy little project. What To Do With The Leftover Hairpin Leg? 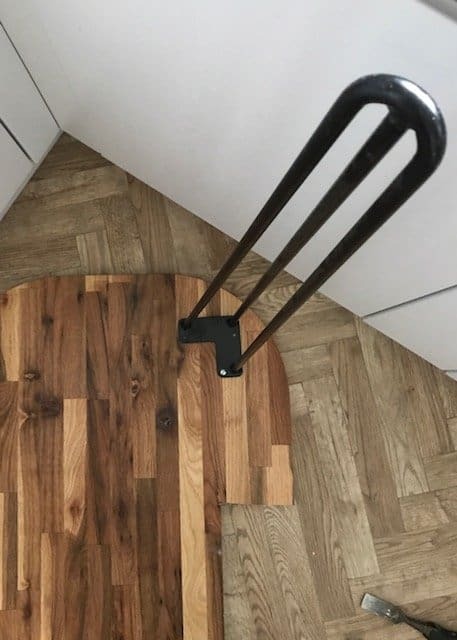 As we only used three out of the four hairpin legs for our breakfast bar, we have one left over. So what shall we do with it? I think we could make a small lean-to table, possibly in the corner of the dining area. If you have any ideas, I’d love to hear them, please leave me a comment! 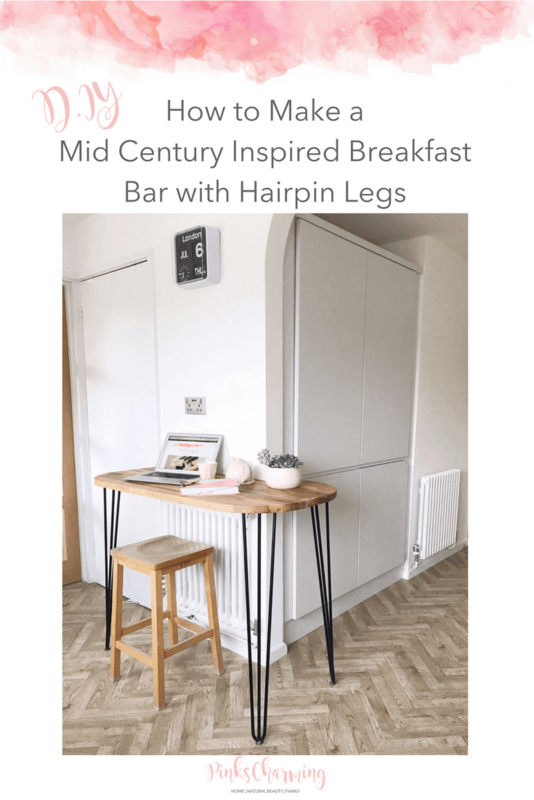 Why not save this guide to how to make a Breakfast Bar with Hairpin Legs Pinterest for later? It looks so good! And making your own things is such a satisfying feeling. I’m in the process of making a couple of mid century inspired nightstands. I need to order the legs, and I can’t wait to see how they turn out. Oh my! this is so clever! I would never have though to do something like this but you have really inspired me. Pinning away as we speak!